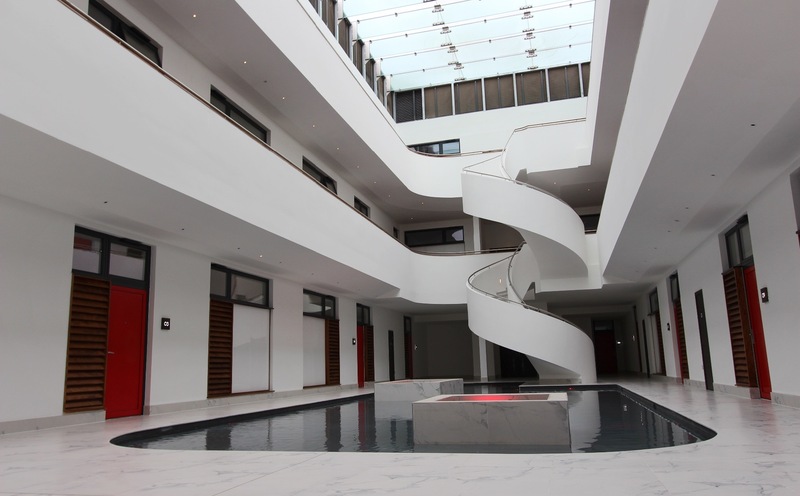 Work has now completed on the stunning Denham Films Studios development in Buckinghamshire where Kallisto Stairs manufactured and installed two stunning precast concrete helical stairs with attached solid concrete balustrades, the first in the UK of its kind. 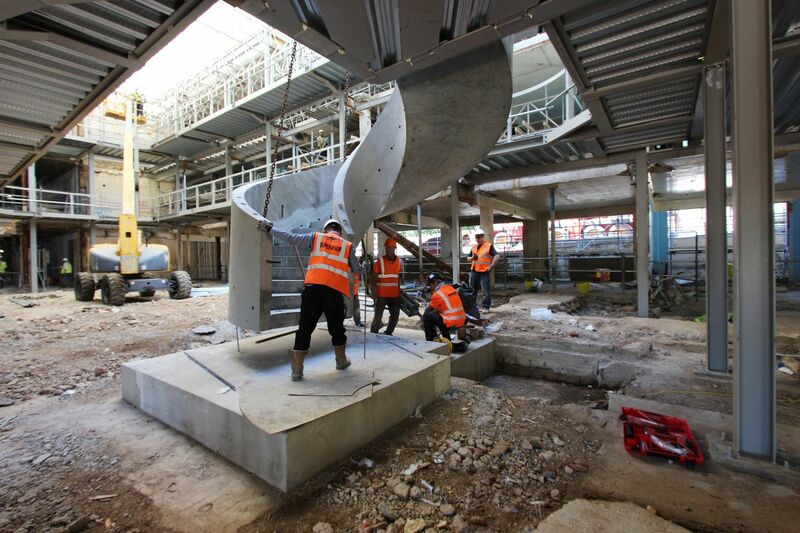 Milbank Concrete Products, who have over 70 years’ experience in the production of high quality precast concrete products, would like to introduce you to Kallisto Stairs – a new concept in the United Kingdom for precast concrete curved stair design. Kallisto’s expertise has been commissioned for luxury staircase installations in some of the most prestigious venues in the UK, working with architects, engineers and designers on a daily basis to produce stunning, durable precast concrete helical staircase installations. 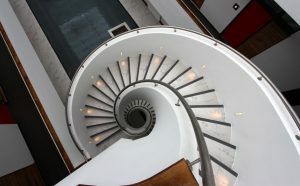 Kallisto are dedicated to helping their customers succeed by providing beautifully sculpted precast concrete curved staircases as a cost-effective alternative over traditional, insitu methods – they believe they are the only company in the UK that can provide precast concrete curved staircases as economically as possible. Manufactured and crafted by hand at their facility in Essex, Kallisto stairs are delivered in one complete piece and fitted with ease in less than a day by their expert installation team covering the whole of the UK. By offering an unparalleled service from the design stage through to manufacture, delivery and installation, Kallisto ensure that their client’s expectations are exceeded every time, whilst keeping production costs to a minimum. Kallisto ensures an element of sophistication and elegance; their stairs offer a versatile alternative to other traditional materials such as timber or steel. Resilient, solid and durable, a Kallisto stair can be attractively finished in a material best suited to the individual style and character of a development, such as marble, stone or timber. The Denham Film Studios are a unique collection of 224 conversion and new build homes, including 154 one, two- and three-bedroom apartments and 70 four- and five-bedroom family townhouses. Features within the new development include a retained and restored cinema with bar and a community hall/fitness space. The new properties are designed around garden squares, landscaped grounds, rill water features, private gardens and protected woodland complete with parking and garaging. The main Grade II listed building was converted into 49 elegant apartments, around two new green squares and communal gardens, bordered by three new four-storey apartment buildings providing 105 new homes. Around the eastern side of the site there are avenues of new three and four-storey terraced housing, and to the northern section two and three storey detached townhouses; all overlooking communal landscaping and private gardens. The retained cinema – which was used to screen movies to Hollywood directors including Stanley Kubrick, Albert “Cubby” Broccoli and Steven Spielberg – was refurbished and turned into a cinema theatre and club for residents; retaining an important link to the history of the site. Milbank Concrete Products (including Kallisto Stairs) have a long history of providing high quality precast concrete solutions for the construction industry and their experience and reputation led to them being chosen by Weston Homes Plc for this project. 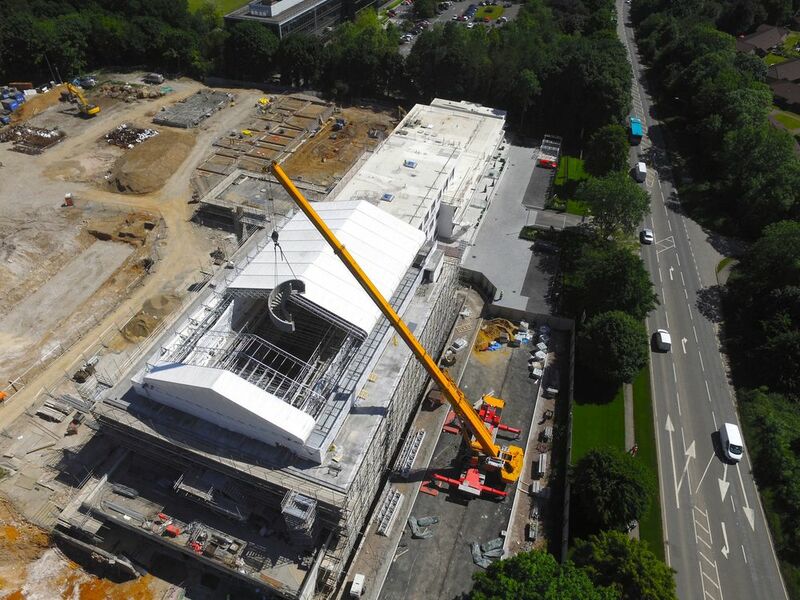 Kallisto were able to generate the required soffit using their specialist adjustable pallet moulding system, which also acted as the formwork for each storey height flight. Ducting and fittings for lighting were also incorporated into the concrete walls at this stage. The two 4m diameter flights, each weighing over 11 tonnes, were delivered to site on a low loader and installed in one day by one of Kallisto’s professional fixing teams, minimising disruption on site and providing an immediate access to the upper levels for other trades. 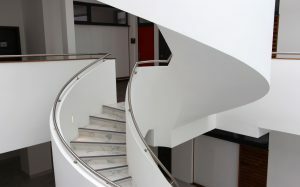 Weston Homes approached Kallisto to investigate if they would be able to provide two precast concrete helical staircases at their factory in North Essex, incorporating 150mm wide by 900mm high concrete handrails to tie up with the art deco style balustrading to the circulation areas of their flagship development site in Denham. Constructing these flights insitu would have proved to be challenging in terms of generating the flowing soffit and erecting the necessary formwork which would have needed to remain in place for at least 4 weeks after the second flight had been cast. A staircase with a built-in handrail of this size has never been made off-site in a factory environment and was a real technical challenge to not only structurally design but to also tie in with the buildings design. There were also restrictions on transport to site and how they would be lifted into position to consider due to the sheer size and weight of each individual flight. Although immensely challenging, the team at Kallisto were completely satisfied with the final result and the effort administered certainly resulted in a well designed, manufactured and installed finish product. If you would like to know more we would love to hear from you. Our technical consultants and estimators are ready to assist you with your project requirements. To view our gallery of completed projects, click here. Alternatively If you would like to know more just visit the website by clicking kallistostairs.co.uk or click here to view an online version of our brochure.